Should you invest in these three mobile app makers? 1.3 billion smartphones were shipped globally last year according to IDC, and hordes of developers are trying to profit from that growth by launching mobile games. Mobile games can surge in popularity in a short time, but they can fade away just as quickly. Let's take a look at three major mobile game makers -- Zynga (NASDAQ:ZNGA), King Digital Entertainment (UNKNOWN:KING.DL), and Glu Mobile (NASDAQ:GLUU) -- to better understand the benefits and drawbacks of investing in this volatile industry. Shares of Zynga -- the maker of Farmville, Zynga Casino, and Words With Friends -- have tumbled 70% over the past five years due to its loss of users and revenue. Between the first quarters of 2013 and 2015, Zynga's monthly active users fell from 150 million to 100 million, which caused its revenue to plunge. Zynga prefers investors to refer to "bookings" instead of revenue as a more accurate measure of its growth. Bookings are total purchases of virtual products (like in-game energy), which are first reported as deferred revenue, then recognized as bookings over the estimated time that it takes to consume the product. But ironically, that calculation makes Zynga's growth look even worse. Last quarter, Zynga's revenue rose 9% year-over-year, but bookings inched up less than 4%. On the bottom line, Zynga posted a net loss of $46 million last quarter, a slight improvement from a loss of $61 million in the prior year quarter. To top that off, CEO Don Mattrick abruptly stepped down in April and was replaced by founder Mark Pincus. 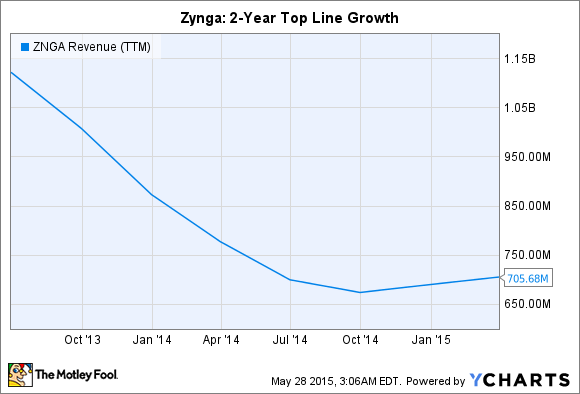 On the bright side, Zynga's average booking per daily user rose 18% annually last quarter. It also reported that mobile bookings represented 63% of all bookings in the first quarter, up from 36% a year earlier. Unfortunately, squeezing out a little more cash per user and reaching more smartphones isn't enough to convince me that Zynga is poised for a turnaround anytime soon. King, the maker of Candy Crush Saga, isn't doing much better than Zynga. The stock currently trades more than 30% below its April IPO price of $22.50. However, King's numbers look a lot better than Zynga's. Last quarter, King's gross bookings and revenue both fell 6% year-over-year, mainly due to unfavorable currency impacts. Excluding that impact, gross bookings were up 7%. King has continued to diversify its top line away from its core Candy Crush titles, which only accounted for 38% of its gross bookings last quarter. King's monthly active users rose 14% year-over-year to 550 million, making its gaming network 5.5 times larger than Zynga's. Unlike Zynga, King is profitable -- its quarterly profit rose 29% annually to $164 million last quarter. Unfortunately, shares of King fell as much as 11% on May 14 after it lowered its second quarter bookings guidance to $490 million-$520 million, which represents a sequential decline of 14% to 19%. King stated that the mid-year period would be "seasonally softer", although growth would return in the "latter part of the year". The company also didn't announce a special dividend for shareholders, as it did twice over the past year. Glu Mobile is much smaller than Zynga and King, but it uses a surprisingly successful strategy: developing celebrity-licensed games. Most of the stock's 60% year-to-date rally was fueled by the success of Kim Kardashian: Hollywood, which accounted for 31% of its 2014 revenues. Last quarter, Glu's revenue rose 59% year-over-year to $44.6 million, and it reported net income of $1.1 million -- up from $0.1 million in the prior year quarter. However, monthly active users slipped 15% year-over-year to 54.6 million. Kim Kardashian: Hollywood. Source: Google Play. Like King, Glu has been diversifying its top line away from its top title with new games like Deer Hunter, Eternity Warriors 3, Racing Rivals, and Dino Hunter: Deadly Shores. It also intends to maintain its celebrity-fueled growth with new games featuring Kylie Jenner, Kendall Jenner, and Katy Perry. Those new titles could generate fresh user growth and keep Glu's top and bottom lines moving in the right direction. Chinese Internet giant Tencent is a big believer in Glu's business model -- it agreed to buy nearly 15% of the company for $126 million in April. Investing in mobile app makers like Zynga, King, and Glu Mobile isn't for the faint of heart. These companies have to constantly launch hit titles to keep growing, and user growth can be unpredictable due to fickle user tastes. However, if I have to invest in these three companies, I would definitely choose King and Glu over Zynga. King has robust user and bottom line growth, while Glu has a surprisingly profitable business model with major star power.